Though UX/UI design has no widely-accepted definition, we can still say with certainty that it’s about the user and creating the pleasure when using a project. Such a big subject can be intimidating on first glance, and the sheer amount of UX/UI books also make most of us feel overwhelmed. For those looking for expert techniques so as to get an edge in UX design, we have rounded up a complete list of 12 free UX and UI books that anyone can enjoy and benefit from. Take a look and may you find the favorite one to sharpen your skills! 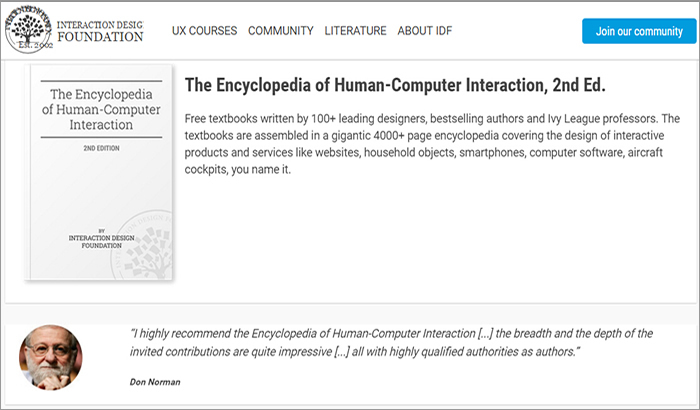 Free and high quality textbooks recommended by Don Norman, “I highly recommend the Encyclopedia of Human-Computer Interaction, the breadth and the depth of the invited contributions are quite impressive, all with highly qualified authorities as authors.” They are well written by more than 100 design experts, bestselling authors as well as Ivy League professors. Those textbooks, featuring 4,000+ page encyclopedia, covers a wide range of Human Computer Interaction related topics, including social computing, contextual design, requirements engineering, usability evaluation, tactile interaction, visual aesthetics and 3D user interfaces, etc. As a classic in UX design, 50 User Experience Best Practices outlasted the design agency that originally wrote it. Covering all aspects of user experience design from user research to front-end development, this guidebook adopts reasonable backing and illustrative visuals to showcase 50 best practices for UX professionals. Those listed techniques are broken into categories for better understanding and fast browsing. As a cover-all guide of UXPin, Web UI Design Best Practices endows serial technical analysis written with simple language that readers usually expect. It’s broken into different sections on color, visual hierarchy, UI patterns, typography and navigation, etc. Believe it or not, CSS plays a more and more important role in our modern design. Adam Schwartz, the author of Magic of CSS, introduces some tricky aspects of CSS in easy-to-follow and straightforward language. It’s comprised of several chapters, including The Box, Layout, Tables, Color, Typography, Transitions and much more interactive examples. This is another classic published by usability consultancy firm — Userfocus. A big plus of this book is the adopted laid-back and casual tone, which makes it memorable for readers. The acronyms of Beatles Analogies and “the CRAP way to usability” also make this book an interesting read. The UX Reader of MailChimp includes all of the important components involved in the UX design process. The all-in-one ebook is great for beginners to learn from scratch, but is a handy guideline for veterans to put on their shelves. It delivers valuable insights and lays out UX design into 5 categories: Collaboration, Research, Design, Development and Refinement. It’s available for free download. The previous versions of this well-acknowledged book sold over 400 thousand copies since the first edition in 2000. Each edition has become much-loved introductions to hundreds of thousands of developers and web designers. The third edition is still much needed after 16 years back and returns with fresh insight to re-examine the principals on mobile usability. Considered as a classic among UX books, UX Storytellers is deviated from a “textbook” format. As its name indicates, the book makes a good collection of real-life advice and stories from 42 UX professionals and experts in this field. It was firstly published in 2009 and still continues to be a very insightful read to learn about the solutions and struggles that UX designers doomed to face. This is an ebook of Mardn Treder, covering 127 pages of life-based advice for both start-ups and grown-up companies. Almost every company tends to use refreshed user interface/experience design, and those handpicked prototyping and wireframing design tools will be a good companion for mobile and web app designs. With it, anyone can quickly learn how to validate product assumptions and thus optimize designs. A free book for web designers with 166 examples of web design and the latest trends in 2016. Also there is a list of 100 preferred design resources, along with a number of case studies showing the best techniques. Those cited practices come from renowned companies, such as Intercom, Reebok, BMW, Adidas, Google, Jawbone and much more. With more than 100 page, this book is a complete companion for engineers, PMs, designers and anyone who will touch a product. Not only does it include a comparison of prototyping tools, but also explain trending UI design patterns. This free ebook will guide you through the best practice and theory of design across every stage in the development process.